Function is typically the primary consideration in the design of an industrial mezzanine. That's what makes this pair of free-standing mezzanine structures in Waikoloa, Hawaii, so special. Manufactured by Panel Buit, Inc. and constructed for the West Hawaii Sewer Company in the summer 2009, these two units are both functional and attractive. Perched on a rugged ocean hillside with constant exposure to wind and salt spray, these unusually colorful mezzanines were treated with a ZP rust inhibitor prep agent and have exterior grade powdercoating. The beams and joists are bright blue, the columns are red and the railings are yellow. The railing color was a standard safety-related pick but the other two colors were based on customer preference. Both mezzanines were designed and manufactured by Panel Built Inc. 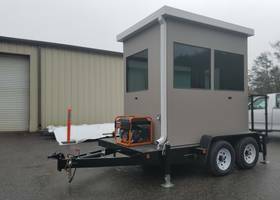 The smaller unit is 17'-3" x 24' with a 12' clear height. Its columns are 7" x 7" x ¼" tubular steel, supporting a maximum load of 26,235 lbs. The larger structure measures 51' x 41' and has a 15' clear height. 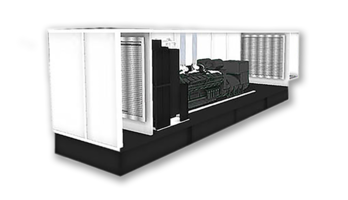 Utilizing 10" x 12" columns, it carries a maximum load of 54,350 lbs. Sitting atop the bigger mezzanine's deck are a pair of small, aluminum-sandwich-panel-clad modular buildings, also designed and built by Panel Built Inc. Similar in size and style, one of the buildings is used as a Motor Control Center while the other serves as a Control Room/Plant Office. Both mezzanines feature galvanized steel decking and molded fiberglass floor grating. WSI International, LLC, of Kailua-Kona, Hawaii, was the general contractor on both projects. Erection services were handled by Kona Kau Construction Services & Supplies Inc. of Kailua-Kona, and Dorvin D. Leis Co. of Kahului. The smaller one was built first. With a construction schedule lasting approximately five weeks, it was completed in June. The larger unit took eight weeks to assemble. It was completed in August. 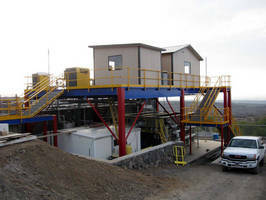 To learn more about mezzanines and modular buildings from Panel Built, visit www.panelbuilt.com. 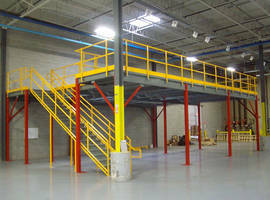 Vibration Dampening System is designed for mezzanines.